Alcaniz (Spain), 11 April 2015 – With a fabulous lap Leon Haslam rode his Aprilia RSV4 to the front of the pack on the starting grid. 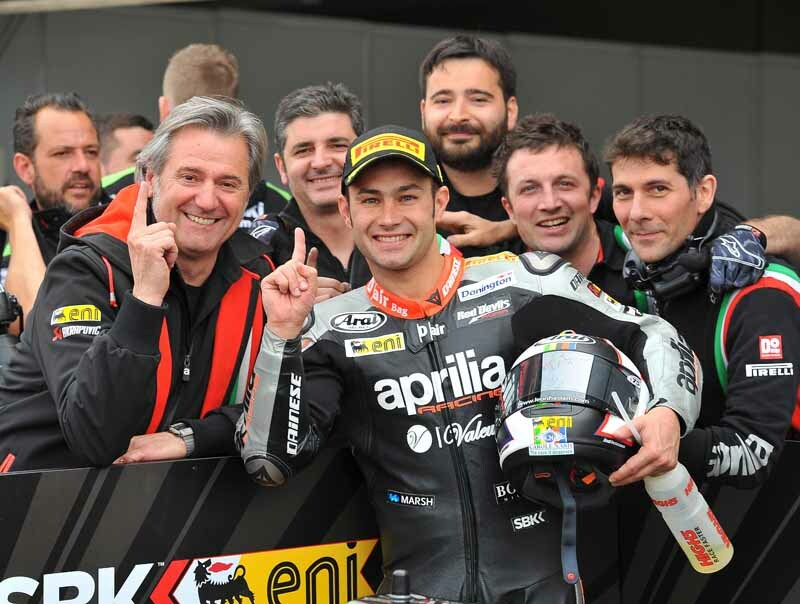 The Aprilia Racing Team – Red Devils English rider achieved an impressive feat today. After a cautious start (in the first timed session Haslam had the tenth best time), Leon and hi team consistently improved, taking the RSV4 RF into second position in the FP4 sessions that preceded Superpole. At that point Leon began the decisive session aware that he could be fast, but his performance with a qualifier tyre of 1’49.664 was extraordinary since it was almost two seconds faster than the times he put on the sheets in the FP4 sessions. It was definitely a team result since work was done on various fronts, from the chassis to electronic control management, aiming at finding grip and speed in the various conditions without stressing the tyres too much in a race setting. For Leon Haslam this is the second pole in his Superbike career after the one he took at Phillip Island in 2010. Jordi Torres also managed to improve his performance significantly compared to yesterday. The Spanish rider, determined to do well on his home track, is still not able to push his RSV4 RF to the limit, but he is showing continuous improvement, just like in the first two weekends of the season, which goes to show his commitment and steadfastness. He finished Superpole with the seventh best time which earns him a spot on the third row after using the “specialist” Pirelli qualifier tyre for the second time.